What do we do about Sunny? The recent furore regarding Sunny James and the removal of his belongings from public property reminded me that the London Homeless Coalition needs a position statement on how to address people experiencing homelessness engaging in private behaviours in public spaces. This issue actually harkens back to the lock down of the Victoria Park bandshell in 2014, and before that the increased ticketing of people experiencing homelessness around the World Figure Skating Championships in 2013. So, I’ve taken a crack at it and would be interested in feedback on the wording and the approach. Please note, this is just a DRAFT and in no way reflects policy of the London Homeless Coalition. Compassion – In considering the appropriate response, all persons should come from a position of compassion, acknowledging that engaging in private behaviours publicly is not deliberate, but is rather of function of lacking personal, private space to do so. Relationship – If approaching individuals experiencing homelessness regarding behaviours in a public space, all persons should first seek to come to know and understand the individual and their circumstances. Least Punitive Response – Although ticketing or temporary incarceration may address the immediate issue, neither have been proven to be effective long-term in ending homelessness and the consequent public activities. 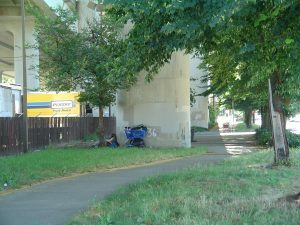 In fact, ticketing has been shown to be an additional barrier to permanently exiting homelessness. Therefore, if coming from a position of compassion and relationship, behaviours must be addressed, this should be done by seeking mutually agreeable alternatives to punishment. Advocacy – Any person engaged in confronting public behaviours of people experiencing homelessness can be of assistance to systemic change. By bringing their experiences of dealing with such issues to tables such as the London Homeless Coalition, they can help us and our partners find more effective long-term solutions. Discretion – All individuals in public spaces should be generally left alone unless they are of harm to themselves or others. For example, there is no reason to engage with people who are legally panhandling within the guidelines of the Safe Streets Act. Threats of ticketing or arrest should not be used as a means to move people out of sight of those attending the major event. Human rights – All individuals have a right to be present in public spaces, this includes individuals displaying symptoms of an active mental health challenge. Activities perceived as abnormal, if legal and of no harm to self and others, are not justification for confronting an individual in a public space. Collaboration – Increased policing and security may unintentionally lead to the observation of behaviours that are illegal under municipal by-laws or the criminal code. Persons addressing these behaviours are encouraged to work collaboratively with street outreach or mental health crisis services in considering their response to these behaviours. Photo courtesy of https://www.flickr.com/photos/12567713@N00/ under creative commons license. This entry was posted in In the News by abeoudshoorn. Bookmark the permalink. It is great to read these thoughts and recommendations as they are laid out in your draft. I have many thoughts and ideas but I am not familiar with the issues specific to London; I work with homeless individuals in Hamilton. What I would add to the last section on collaboration is specifically that constructive dialogue between policing entities and mental health outreach services, as well as with persons with lived experience, should also be encouraged. When the cultures of emergency services, mental health and lived experience are given the opportunity to share their perspectives with each other at non-critical moments, I think it helps communication between them during a crisis event. I agree with the basic principles illustrated in your essay. Well done. Further to your essay I say our current affordable housing issues do not address the needs of people such as Sunny who do not wish to live in permanent accomodations. The city and thus taxpayers could redirect funds spent on authorities enforcing antiquated laws by supporting the concept of “designated open living spaces” during the spring and summer months when the temperatures are at least 20C over-night. During. the fall amd winter months many of the apt buildings and old abandoned warehouses could be renovated to accomodate the concept I mentioned above. The cuurent local rental market could accomodate every brand of housing requirement with a little imagination. Thank you for inviting feedback. I look forward to reading future comments on this important subject.